Time for a quick one. I’m not a programmer, but Minesweeper strikes me as a fairly solid introductory project. 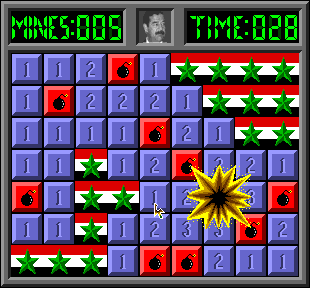 There aren’t a ton of Minesweeper clones out there, but among them is Saddam’s Revenge, a Macintosh version by David Zwiefelhofer. Zwiefelhofer made Saddam’s Revenge while learning how to program, and given that it was created at the end of the Gulf War, the Saddam theme is appropriate (though he says there wasn’t any political motivation behind it). It is nearly indistinguishable from other versions of Minesweeper save for a denser field and a few shiny graphical effects, such your mouse getting blown up by bombs. 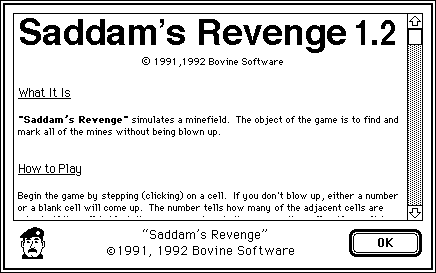 Saddam’s Revenge is fun as a historical artifact. As with many Mac games developed at the cusp of the transition to color monitors, it’s available in both black-and-white and color with minor differences in the art style. If you ever wanted a game that successfully captures the 1992 Macintosh experience, this would be it: a half-color, garage-made shareware game about Saddam.